October always brings around the creepies and the crawlies and scares galore, and what better way to celebrate Halloween than with a big-screen double dose of everyone’s favorite lumbering monster? Turner Classic Movies and NCM Fathom are teaming up again to bring a double feature of the classic Universal horror films Frankenstein (1931) and Bride of Frankenstein (1935) to theaters nationwide for one night only, on Wednesday, October 24th! Each film has been newly restored in honor of Universal Studios’ 100th anniversary this year. The screening will be hosted by Robert Osborne and will feature exclusive interviews that the venerable TCM host conducted at April’s TCM Classic Film Festival with Sara Karloff, daughter of the films’ star, the legendary Boris Karloff; Bela Lugosi, Jr., son of another classic horror icon, Dracula star Bela Lugosi; and Rick Baker, seven-time Academy Award-winning makeup artist (for An American Werewolf in London, Ed Wood, and most recently The Wolfman, among others). For more information about this event and to find a participating theater near you, check out the Fathom Events site. Note: The double feature begins at 7PM local time. However, some locations may also feature matinee showings of the films. Check your city’s theater listings for more details. Are you dying (bad pun alert) to see these films? Let us help get you to the theater! 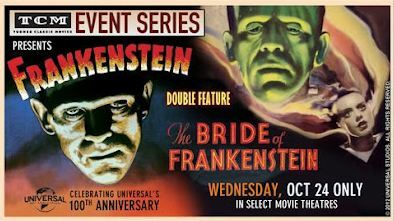 True Classics is pleased to announce that we are giving away three pairs of tickets to the Frankenstein double feature. To enter, simply send us an email to trueclassicsblog (at) gmail dot com with the subject line, “I want Frankenstein tickets!” and we’ll toss your name into the metaphorical hat. Entries must be received by Thursday, October 18th, at noon CST. Winners will immediately be notified by email and will have 24 hours to respond before a replacement winner’s name is drawn. We interrupt the tumbleweeds rolling across this blog for a brief update.